Ahh. Finally. The App Store is getting a makeover. Apple’s App Store was introduced in 2008, opening the doors to endless opportunities for both iOS users and developers worldwide. Let’s take you back in time for a second…the year 2008 brought us the portable GPS, the first Amazon Kindle, and the iPod Touch. And the first hot app in the App Store? Super Monkey Ball (gone, but not forgotten!). According to Statista, the App Store has been home to over 2 million apps since launch and has generated over $70 billion in revenue. However, there has been practically no change to the aesthetic layout and experience within the App Store in its 9-year life span. That is, until this upcoming Fall, when Apple will roll out a completely new look and feel to the store that it introduced at this year’s WWDC. It’s about time for a change, especially since Google has been testing major changes to its Play Store in recent months and announced some makeovers of its own during this year’s Google I/O conference. 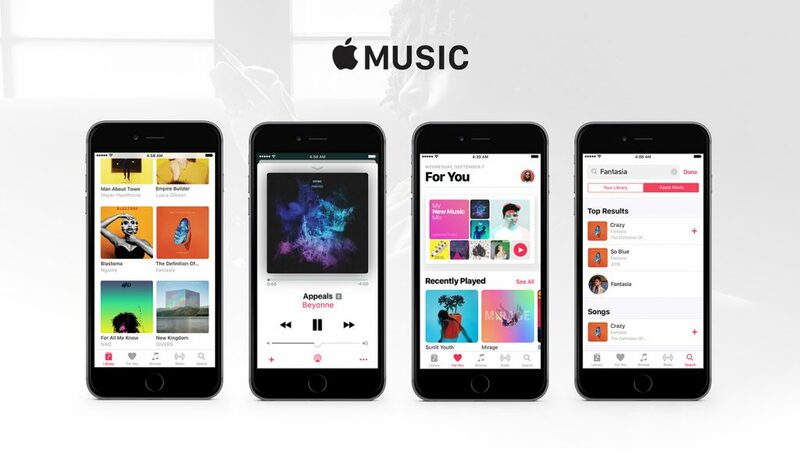 Our initial impression of the new look is that it reminds us of the aesthetics of the highly successful Apple Music store. Large, clear headers with the category or feature names, big end-to-end graphics displaying featured apps, and an overall more colorful and fun look. While the new aesthetics gives the store a much needed fresh look, more important is the new content that Apple is adding to the store. According to Apple’s announcement, the new store will feature stories, expert recommendations, crafted “lists” (perhaps new categories for featured apps), and new ways to discover apps to fill users’ actual needs. 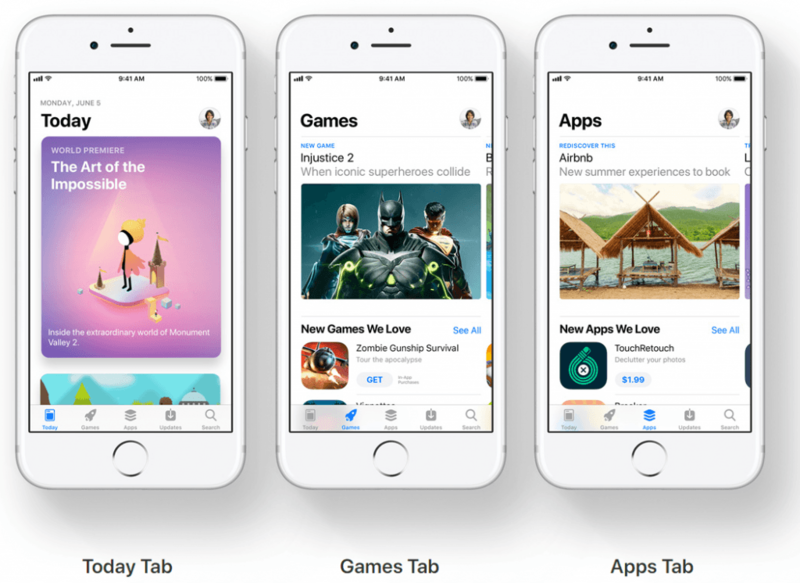 The App Store will be divided into 5 key tabs, just as it is now, but with 3 new ones alongside the familiar “Search” and “Updates” tabs. The new tabs are “Today”, “Games” and “Apps”. The Today tab will be a scrollable page that features app content written by Apple editors, celebrities and influencers. Content will include behind-the-scenes stories, tips, how-to guides and interviews. Lucky developers who will get this type of featuring will also be able to share their app’s stories from the Today page with a tap on a social sharing button, giving them even more exposure. This is a super interesting step as Apple looks to turn the App Store into a piece of entertainment in and of itself, not just a market for it. One of the most influential change in our eyes as ASO experts is the separation of “Games” and “Apps” into separate tabs. The Games tab will likely make it much easier for users to discover new and featured games and give game developers more opportunity to get under the spotlight. Quality apps, with strong and ethical marketing practices (proper ASO, social engagement, branding, etc.) and a buzzing user base will reap the most benefits of this change. The Apps tab will feature everything but games, aimed to showcase apps tailored to users’ everyday needs. User favorites like utility, productivity, and health & fitness apps will likely make a lot of noise here. While the Search tab will keep its same name and place, it will have a new look and feel with expanded results. Search results will not simply be lists of apps with their icon, title and screenshots. They will now include in-app purchases, quotes from developers, editorial stories, tips & tricks and more. 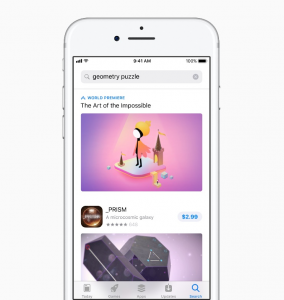 App publishers will now have a much wider range of content to leverage in order to increase search visibility and conversion. What does it take to get featured? So with all of these new opportunities to get featured and receive editorial content, how can developers and publishers get noticed and get featured? As you might already know, this is a tough nut to crack. There’s no paid placement or a checklist of requirements. And according to Apple, editors base their decisions on a variety of criteria that vary for different apps and games. Here at yellowHEAD, our ASO team can’t be more excited for these new changes. And with iOS 11 Beta being available to developers today, we strongly encourage developers to start planning and preparing their apps to make the most out of the biggest update to the App Store since its inception. Thanks for reading, stay tuned, and feel free to contact us any time!